What does Flying Spaghetti Monster mean? The Flying Spaghetti Monster is the supreme being of a parody religion called the Church of the Flying Spaghetti Monster. Followers of the Flying Spaghetti Monster refer to themselves as Pastafarians and their beliefs are sometimes called Pastafarianism or FSMism. You might say that because science can explain just about everything but not quite, it`s wrong to say therefore we don’t need God. It is also, I suppose, wrong to say we don’t need the Flying Spaghetti Monster, unicorns, Thor, Wotan, Jupiter, or fairies at the bottom of the garden. Where does Flying Spaghetti Monster come from? In 2005, Bobby Henderson, then an unemployed physics graduate, proposed in an open letter that the world was created by a deity made of pasta, the Flying Spaghetti Monster. The open letter was a response to the Kansas School Board’s decision that schools be allowed to teach Intelligent Design, the idea that the world was created by some intelligent higher power, in science classes. In Henderson’s open letter, he argued that that students should also be taught the “alternative theory” that the Flying Spaghetti Monster created the world. Henderson posted the open letter to his personal website, which received over 14 million hits in the following weeks. Three members of the Kansas School Board wrote letters of thanks to Henderson, while one member wrote to rebuke him. Soon supporters started producing art depicting the Flying Spaghetti Monster and describing encounters with the being. Courts around the world have attempted to tackle this question as well. In New Zealand, Pastafarians are now allowed to officiate marriages. A Texas Pastafarian was given permission to wear a pasta strainer on his head as “religious headgear” in his driver’s license photo, but a New Jersey man was denied the same request. 'In the Church of the Flying Spaghetti Monster we have religious headware as well but we’ve had to fight for the right to wear it . Who uses Flying Spaghetti Monster? 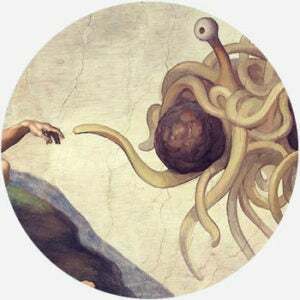 The Flying Spaghetti Monster is most frequently referenced by atheists and other critics of organized religion, usually in an attempt to dismiss certain religious beliefs as absurd. The noted atheist writer Richard Dawkins even referenced the Flying Spaghetti Monster in a debate. Yeah the Atheism hashtag gets intense doesn't it? I only occasionally chime in on those threads. Usually a waste of time but can help sharpen the wit sometimes. Just remember, the flying spaghetti monster loves you. In a more light-hearted vein, non-believers may, tongue-in-cheek, call on the Flying Spaghetti Monster in lieu of a traditional higher power. THE FLYING SPAGHETTI MONSTER IS A TOOL OF SATAN!! !